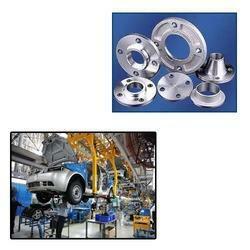 Manufacturer of a wide range of products which include stainless steel flanges for automotive industry. We are a leading supplier and retailer of Stainless Steel Flanges For Automotive Industry. Stainless steel flanges are used for sealing the ends of a pipe without welding. Access to the inside of automobile and service in-tank immersed suction strainers and diffusers are provided by stainless steel flanges. High temperature applications widely employ stainless steel flanges which are also corrosion resistant. Looking for Stainless Steel Flanges for Automotive Industry ?